It’s damp, grey and dark here in Irvine today, but on Sunday last, Nita and I caught the end of the fine weather and made the most of it with a working walk in the hills. 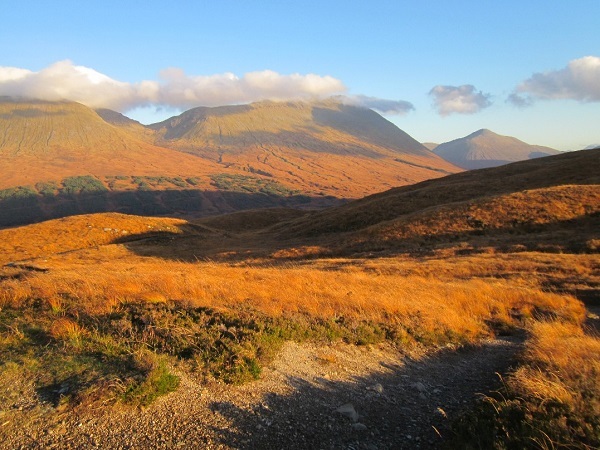 We hadn’t been out for a week or two so it was with a real sense of excitement that we drove north through the beautiful scenery of the Loch Lomond National Park. Huge banks of fog lay over the loch, sometimes shrouding everything including the road, sometimes pulling back out onto the water to give amazing views of the summit of Ben Lomond sticking out above it. The colours were superb in the bright early sunshine and I had the feeling that even if I didn’t get any sound recordings made during the day, I’d certainly see some great views and maybe get some new ideas for paintings. But that said, you do have to get your priorities right and as we drove through this spectacular autumn landscape our minds were firmly fixed on breakfast at the Green Welly and one of their fine bacon rolls! Once this was accomplished I’d put my mind to work ….but not before! One of the problems I’ve encountered during my first attempts at making sound recordings in the wild is that there can often be a lot of background man-made noise. 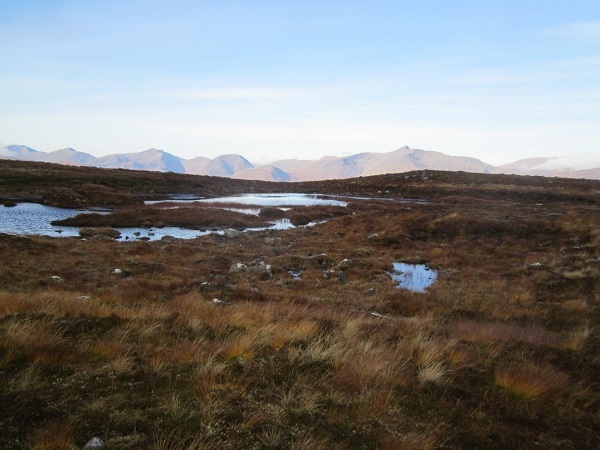 I decided therefore to head back to a small hill we’ve walked several times in the past and one that is set well back from the main roads and isn’t an ‘anything’ …like a Munro or Corbett or Graham. Being unclassified it, tends to be less frequented by other walkers. 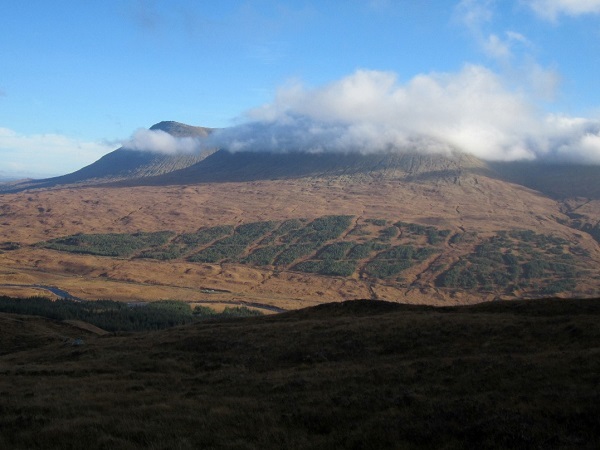 The wee hill in question was Ben Inverveigh……rising between Glen Orchy and Loch Tulla. I hoped that from its broad rough summit ridge I might be able to capture something of the wild in a recording. It’s difficult to explain quite what I’m after except that there are wonderfully subtle sounds of space and quiet when you’re up in the hills ….and these are what I want to try and capture with the sound recorder. Ben Inverveigh is only around 650m high but even so its upper slopes were periodically shrouded with cloud and it made for quite a strange atmosphere as the mists came and went, sometimes reducing the visibility considerably and sometimes breaking so that we could see the bigger hills around us. We stopped by one of the two small cairns marking the official top and after a quick bite of lunch, I set the sound recorder working…..propped on a small rock with its microphone sheltered from the cold breeze. Over the ten months I’ve had use of this recorder, I’ve made quite a lot of recordings, but most have failed to capture quite what I want. Many of them have as I said, captured the background noise of traffic or passing aircraft…..or me sneezing or Nita eating a bag of crisps as happened on one occasion! Recording sound is not easy you know! Anyway, on Sunday we did seem to have perfect conditions and when I switched the recorder on I felt rather more optimistic about the results than normal. I’d have to wait until I got home to have a listen to the recording, if for no other reason than that it was bloody cold up there and we needed to get moving. The walk back saw conditions improve considerably and before we were half way down we found ourselves in bright late afternoon sunshine. The colours were once again, very beautiful and quite intense. The spiky clumps of grass that made up much of the covering vegetation on this hill were a strange mixture of colours, ranging from a reddish brown at the tips, to a rich straw colour and to a vivid yellow green at the base of each blade of grass. This meant that the overall colour seemed to change depending on which way the breeze blew. By the time we got back to the car the light was fading fast but we’d had a great little day. Not only did I get some ideas for new paintings, I also, it turned out, managed to get my first half decent sound recording. I haven’t worked out yet how I’m going to use these recordings ……but it’s a step forward and quite an exciting one too. At some point in the future I’ll get some of these recordings on-line so that you can get an idea of what this crazy painter is trying to do!